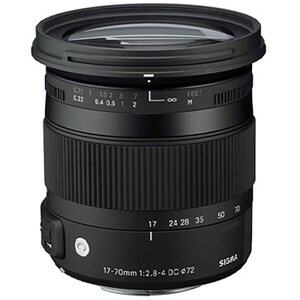 This standard zoom lens is designed exclusively for digital SLR cameras and incorporates Sigma`s original OS function. This lens covers several angles of view, from wide to telephoto as well as offering a large aperture of F2.8 at the 17mm focal length. It provides a bright image through the viewfinder and enables photographers to easily check focusing and composition. The lens has a minimum focusing distance of 22cm and a maximum magnification ratio of 1:2.7 making it ideal for close-up photography as well as landscape and macro photography. ELD (Extraordinary Low Dispersion) glass and aspherical lenses provide excellent correction for all types of aberrations and high image quality is assured throughout the entire zoom range. Super Multi-Layer Coating reduces flare and ghosting. The incorporation of HSM (Hyper Sonic Motor) ensures quiet and high speed AF. Various angles of view The lens has various angles of view from wide angle to telephoto. It is a versatile lens ideal for several types of photography. Close-up Photography The lens has a minimum focusing distance of 22cm and maximum magnification of 1:2.7. It has a 4.7cm working distance between the front of the lens and the subject which is convenient for taking close-up pictures. Sigmaï¿½s own unique OS technology The lens is equipped with Sigmaï¿½s own unique OS function. This system allows the photographer to use shutter speeds approximately 4 stops slower. For Sony and Pentax mounts, the built-in OS function of this lens can be used even if the camera body is equipped with an anti-shake function. As compensation for camera shake is visible in the view finder, the photographer can easily check for accurate focus and ensure there is no subject movement. *It is not possible to use the built-in OS function of this lens when using with Pentax ist* series and K100D DSLR cameras Large maximum aperture of F2.8 at 17mm focal length The large aperture provides a bright image through the viewfinder and enables photographers to easily check focusing and composition. Superior Image quality An ELD (Extraordinary Low Dispersion) glass element plus one hybrid aspherical lens and two glass mold lenses offer excellent correction for all types of aberrations. High image quality is assured throughout the entire zoom range. Super Multi-Layer Coating The Super Multi-Layer Coating reduces flare and ghosting even when the subject is backlit and provides high contrast images. Quiet and fast AF An inner focusing system and HSM (Hyper Sonic Motor) ensure quiet and high-speed auto focus. *AF will not function with Pentax ist* series and K100D DSLR cameras that do not support HSM Rounded diaphragm This lens has a rounded 7 blade diaphragm which creates an attractive bokeh. Inner focusing system The inner focusing system eliminates front lens rotation, making the lens particularly suitable for using the supplied petal-type hood and circular polarizing filters. Convenient handling This lens is equipped with a zoom lock to prevent the lens from creeping due to its own weight, and to offer protection whilst the lens is being carried. A magnification scale is displayed on the lens barrel, ensuring ease of use.